What Does SISL Mean By Sustainability? A sustainable future depends on a workforce of professionals knowledgeable about creating practices, processes, and infrastructure to optimize resource management, and on a community informed about the ethics and influence of human activity on the integrated environmental, economic, and social aspects of sustainability. References: (1) the Renewable Natural Resources Foundation; (2) the National Association of Biology Teachers; and (3) the World Commission on Environment and Development. Some of the benefits of integrating sustainability in your courses. Student Demand: Today's college students are clamoring not only for sustainable practices on their campuses, but also for the knowledge and skills (http://www.careertech.org/file_download/21101092-6b5e-422a-b06c-e917bf7e6a85) needed to address issues of sustainability in their academic, personal, professional, and public lives. Just look at the proliferation of certificates, minors, and concentrations in Sustainability across the country. Student Engagement: Engaged, motivated students, working on real world issues of great importance and urgency, make the teaching and the learning more successful, interesting, relevant, and fun for everyone. More Majors: Increase the number of majors and graduate students for your discipline. Beth Cunningham reports that "Teaching in the context of societal challenges can help attract and retain more majors in STEM fields." Multi-disciplinary Collaboration: The topic of sustainability offers opportunities to learn more yourself and to collaborate with faculty in departments and programs across your campus. Legacy: Your teaching might just help contribute to future solutions to global challenges; what a legacy to leave! Better Citizens: When students develop the knowledge and skills to address the "Big Questions" –– multidisciplinary questions about energy, food, air and water quality, climate change – they become more informed global citizens. For example, students and faculty at the University of Oregon integrate research, education, service, and public outreach around issues of sustainable city design. 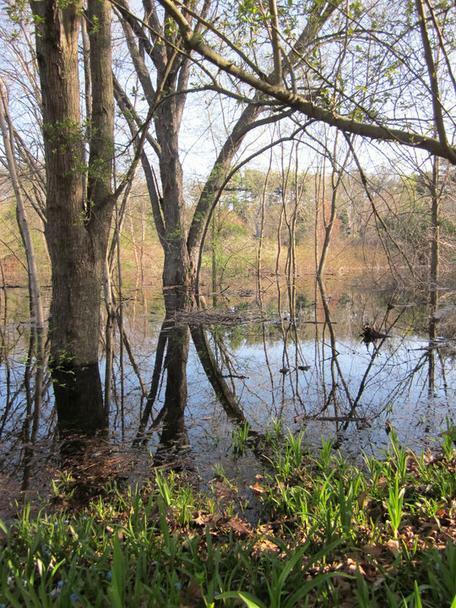 Flooded arboretum, Wellesley College, Spring 2010. Realize that sustainability is not an "add-on" content area; rather, sustainability is easy to integrate into already existing lessons as in-class examples of concepts and as a context for activities and problem sets. When teaching a core course concept, use sustainability-related examples. Add in every course, "How can you use what we are learning to make the world a better place?" Add into every course, "How could we create these products and processes without polluting?" Add into every course, "How could we make these products and processes more sustainable?" Create a real world problem/solving project so students can help their communities become more environmentally sound and sustainable. Integrate these sustainability-related understandings into all learning objectives and assessments. Add sustainability-related learning outcomes into your course objectives. Select any of the learning activities on this Web site as one of your assignments by clicking on Teaching Activities on the left bar.